Which means if you’re going to horde any of the more common seasonings or spices then salt should be highest on your list of priorities. Salt might get a bad rap in the medical community because of how too much can adversely affect your health. But its myriad of uses in everyday life as well as survival situations make it a superstar in terms of how it’ll help you push through when the SHTF. Not only is it extremely affordable, it’s great for food prep, medical use, equipment maintenance, and much more. In the following post I’m going to cover 19 uses for salt in survival situations. After that I’ll go into detail on the kinds of salt you’ll want to keep in your survival stores. I’m surprised I’ve never written about this subject before. The bottom line is if you aren’t already doing your best to stock up on salt once you read this list you’ll want to find some space for salt storage. 1 – Nasal rinse: One of the most popular uses for salt medicinally is using it to both clean and lubricate the sensitive nasal passages. Many people use a neti pot for this. What you’ll do is dissolve 1/2 tsp of non-iodized sea salt and a pinch of baking soda in a cup of water. Add the water to the neti pot, place spout in your nose, tilt your head, and then allow the water to run through and out the other side. This can keep you breathing clearly and also knock out cold causing bacteria and viruses. 2 – Fighting weeds: Weeds can be a nuisance both in daily life and survival situations. Sprinkling salt directly on weeds on patios, sidewalks and driveways can keep them from growing where they shouldn’t. Just tear the weeds out of the ground and then place the salt on the exposed roots to inhibit growth. 3 – Help scale fish: Scaling fish can be a real pain. And if you’ve got to scale tons of fish and don’t want to spend a whole bunch of time doing it one of the best ways to reduce time spent is by scaling the fish after soaking them in salt water. The salt water loosens up the scales making them easier (and faster) to remove. 4 – Use it to preserve food: This is an ancient use for salt and it’s still one of the best all things considered. There are a variety of methods for accomplishing this but you’ll generally want to create a brine and then allow the food to soak in it for an extended period of time so it lasts for a long time (a year or more). 5 – Clean cast iron skillets: Cast iron skillets are incredibly valuable in survival situations and you want them to last. Unfortunately you can’t clean them like regular dishes because it can cause them to rust as well as loose their seasoning. The good news is using salt you can clean them right up ensuring they’ll be with you for quite a while. Just mix salt with water and make a paste and then come through with a rag and give it a nice buff. 6 – Increase cooking time: There are going to be times where speed is absolutely of the essence. So if you ever need to cook in a hurry one of the best ways to get the job done quickly is by adding salt. Salt will cause the cooking temp of the water to rise and it will cook quicker than without it. Contrary to popular belief it does not cause water to boil faster. 7 – Use it to prevent mold growing on food: Similar to preserving, you can soak things like cheese in salt water and then wrap it tightly in plastic wrap to inhibit mold growth. 8 – Put out a fire on a bbq: If you’re ever running a fire pit or a bbq and are watching the flames start to get out of control you can toss salt on it to keep the flames at bay. This way you keep the flames down but don’t kill the coals so you can still cook with it. 9 – Use it to keep teeth clean: A mixture of salt and baking soda in a thick paste can be used to keep teeth clean if you’re ever without toothpaste. If you don’t have a brush you can simply use your fingers to rub the paste on your teeth to polish and clean them. 10 – Knock rust off survival equipment: Rust can destroy valuable survival equipment. So if you’re watching a spot of rust grow then break out some salt and lemon juice and get to work. 6 tablespoons of salt and 2 tablespoons lemon juice mixed together and then rubbed on the affected area with a cloth can help bust the rust off. Once completed check that it is very dry to ensure rust doesn’t return. 11 – Extend the life of milk: Some of you might have the luxury of drinking milk in a survival situation. If you wish to enjoy it a little longer (assuming it’s being kept refrigerated) then you can add a pinch of salt to it. That’ll extend the shelf life by a few days. 12 – Use it to stay hydrated: Many people believe salt water dehydrates you. And while that’s true of sea water, it’s not true overall. Certain forms of salt carry electrolytes (minerals) that are needed for basic health. Water absent of electrolytes is not nearly as effective as water with them. 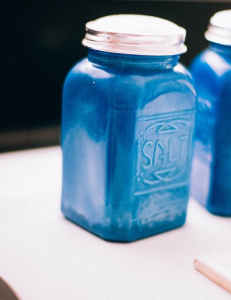 And while salt doesn’t give you all the electrolytes you need it’s certainly better than nothing A few granules of salt in a liter of water will provide some of those valuable electrolytes. Sea salt is one of the best for this. 13 – Keep ants at bay: Salt’s got a remarkable quality of deterring the insects from invading your space. To keep the ants away just create a line of salt where they’ve been coming in. Ants don’t like walking on salt. BONUS: If you want to keep the ants for survival food you can create a funnel with salt and then trap them in a salt lined area or box. Since they won’t cross the salt this’ll give you an opportunity to scoop them up once you’ve corralled them in one place. 14 – Treat an insect bite: A paste of salt on a bee sting or an insect bite can help provide some immediate pain relief. 15 – Treat a sore throat: The odds your body will start to feel the effects of stress in a survival situation are quite high. To combat the soreness you can create a mixture of 1/4 teaspoon salt and 1/2 cup warm water and then gargle several times a day. This saline solution will provide relief and inhibit the growth of bacteria. 16 – Use it to help make soap: Liquid soap in a survival situation isn’t the best thing to transport. Salt added into soap mixtures helps the soap harden which makes it that much easier to transport. 17 – Use it to kill poison ivy: Poison ivy flourishes over much of the U.S. and believe me, you don’t want to rub all over it in a survival situation. To kill this nuisance mix 3 pounds of salt with a gallon of soapy water and apply to leaves and stems with a sprayer. That’ll send it to its death. 18 – Help de-feather a chicken: If you ever need to rely on chickens for food in survival situations you’ll find the process of de-feathering them can be time consuming and frustrating. Using salt to remove the troublesome pin feathers is a common practice used by bird keepers. Rub the chicken skin with salt and then the pin feathers should come out with ease. 19 – Supplement for health: Iodized salt contains trace amounts of iodine which is incredibly important for your health. Then there’s the main chemical ingredient sodium, which you also need. And of course other kinds of salt carry in it loads of other minerals you’ll need for great health. Ensuring your diet has enough salt (but not too much) in it also ensures your body operates at its best. There are countless varieties of salt. More than I can cover here. But I’m going to go over the more common as well as the more affordable. Himalayan Pink Sea Salt: This salt comes from the mountains of Pakistan and is great for cooking. It’s rich in minerals like magnesium, calcium, and potassium and make it one of the better options for supplemental use. Iodized Table Salt: The table salt you’re so familiar with that you get at the grocery store. The problem is if you’re using it for nutritional purposes it’s been so refined it has lost out on beneficial minerals. This salt will do great for many of the more “industrial” survival uses. Kosher Salt: This is a lot like iodized table salt, it’s just in large flakes. Sea Salt: Comes directly from the ocean. After sea water is evaporated this is left over. Sea salt is superior to table salt because it contains trace minerals you’ll need for supplemental use. Celtic Salt: Is sea salt from France. This French salt has a lot of minerals in it because it’s harvested from the ocean and it’s also lower in sodium chloride (the main ingredient in table salt). Keep about 5-10 pounds of salt on hand and you’ll find the survival uses for salt are well taken care of. One of our most popular items we carry happens to be just a little salt and meat. 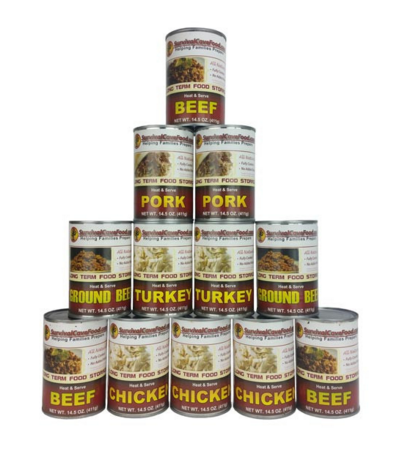 It’s our Survival Cave Canned Meat. Click here to learn more about it and see why everyone loves it. This entry was posted in Family Survival, SHTF, Survival Basics and tagged salt, salt uses, uses for salt on December 16, 2015 by Survival Frog. Salt on the tongue in dentistry is also used to keep patients from gagging! To clean cups or mugs that are left brown inside after cups of tea or coffee. Sprinkle salt inside and clean with a sponge or cloth. Removes all stains inside. I use it for that too. Thanks Pinky!